The necklaces of the Lana Jewelry Blake collection near and dear to the designer’s heart, literally! Signature pieces bearing the name of her daughter are feminine and flattering, whatever their length, weight or width. The pieces range from attractive to alluring and are available in 14kt gold. Choose from white gold, rose gold, yellow gold, and tri-colored gold options. 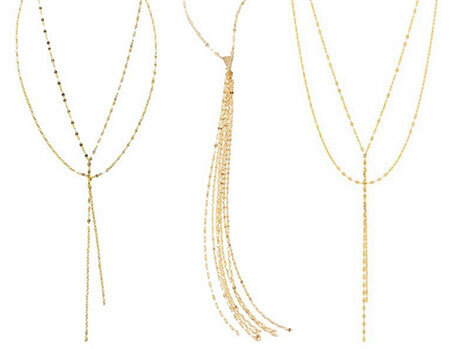 Whether petite, regular or mega, long, fringed or tasseled, there is a delicate and modern Blake necklace for everyone! The collection is marked by an elegant flat link chain that has been diamond cut for engraved facets, and lobster clasp closure. Pieces are intriguing with a fluid design that delivers depth and dimension. Lana Jewelry Blake necklaces are for layering, luxuriating and loving!